We’ve already discussed using drawing charcoal for a dark pounce powder, for transferring embroidery designs on light fabric. 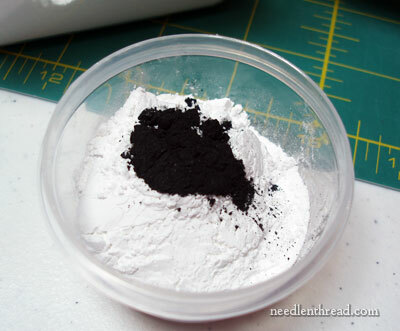 Then we looked at using talc for light pounce powder, for transferring embroidery designs on dark fabric. We’ll call it grey. Or, if you’re insistent on the American spelling, we’ll call it gray. Either way, it’s not black. It’s not white. It’s in between. And this in-between color is nice, because it’s subtler on both light and dark fabrics. If you want to be completely Pounce-Obsessed, you’ll want all three: white, charcoal, and grey. Just to set the record straight, I’m not talking about making your own original pounce powder from absolute scratch. Tanja Berlin does that with her pounce powder, and I applaud her for it. She grinds up the charcoal herself. I contemplated doing that. I have an endless supply of wood charcoal available from my sister’s wood-fired brick oven, but Golly Moses. The idea of grinding it into powder? 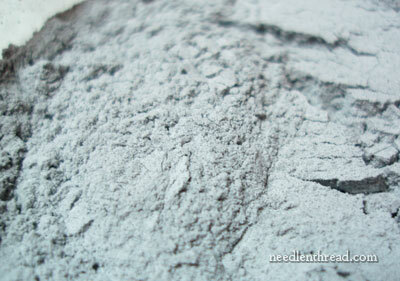 Instead, I used a few pre-made ingredients to make my own grey pounce powder. 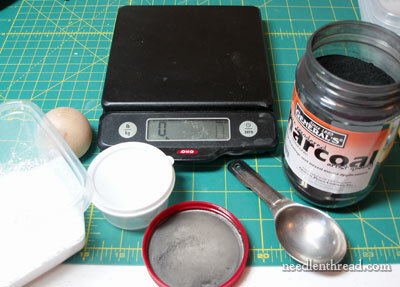 You’ll need 100% pure cosmetic grade, unscented talc (This guy on eBay sells it in different amounts), powdered charcoal (General’s Powdered Charcoal is available at Blick’s), and a little container or tub to mix it up in – preferably one with a lid that seals well. I bought a package of 8 little sealable tubs – about 3″ round and 2″ deep – from the dollar store, for (you guessed it) a dollar. They’re fine for storing pounce powder. Initially, I thought I would weigh out proportions on my kitchen scale, but, since this is for my own personal use and not for any kind of commercial endeavor, I don’t really care how much the stuff weighs or if the proportions are absolutely right every time I mix the stuff up. So I ended up using measuring spoons instead, so that I could keep a vague account of proportions. I started with two tablespoons of talc. And then I added a quarter teaspoon of charcoal. Incidentally, if you do this at home, you might want to cover your work area. I didn’t at first, and then I did a little later. The whole process doesn’t make a huge mess, but if you use your work area for other stuff, like cutting white linen, you might want to take precautions. When I finished, a quick wipe-down with a damp cloth got rid of all residue. Now, because I was using measuring spoons, I was in kitchen-mode. I used a wee little whisk to stir up the mixture. The whisk is totally superfluous. 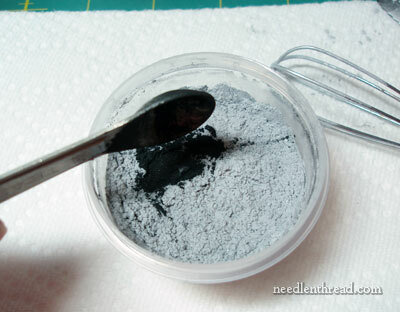 You can see that the powder is getting grey, but not quite as grey as I would like, so I added another quarter teaspoon. All told, I think 1/2 – 3/4ths teaspoon of charcoal is good. 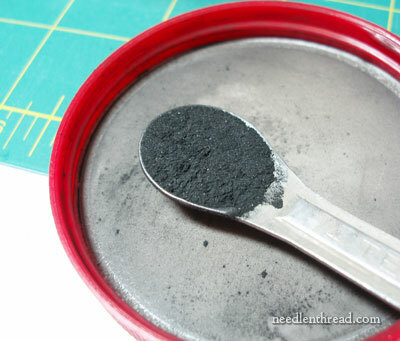 You might want yours a little darker or a little lighter, so you can always add charcoal powder in little increments and see where it gets you. And if you go too dark, add a little more talc. Too light, add more charcoal. This is hardly an exact science! Foregoing the Superfluous Whisk, put the lid on the container and shake it up, baby. Ah. 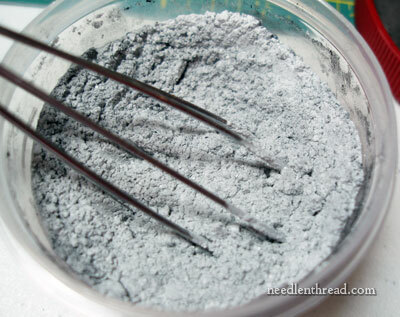 A nice grey pounce powder, and it works grey-t. Great. So, now you have three shades of pounce, and they should get you through any transfer situation. But don’t worry! That’s hardly the end of the subject! Your next question is undoubtedly: But what do you use to pounce the pounce onto the fabric? And I hear you! I’ll show you my home-made pouncing tools tomorrow. For a very low cost, you can make several of them, so that you have one for every color of pounce, plus plenty extra, so you can experiment. If you have buddies who like to pounce their embroidery designs, you could make them kits for Christmas presents – or better yet, you could pool your resources and make enough for all of you, and it will cost you very little. So, tomorrow – my version of a pouncing tool and other needful things to finish up your pounce kit. I’m still here just very chronically Ill! Thank you so much for this Mary! May I link your site to mine I’m doing benefit shows for charities you wan’t in?!? Would the following work for your fine prick and pounce method? 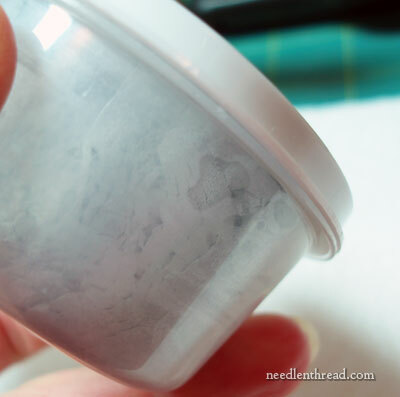 I use this especially for my hand quilting stencils and think it’s the easiest way to mark my quilts. I haven’t tried it on needlework (I use a light box usually and a silver pencil). I’m not doing the fine silk and linen work that you do but much simpler red work and black work. I find it remarkable that you are so disciplined to write every day and be so interesting, with pictures no less. You have so much to share and you are not selfish. I admire you very much and your work is so beautiful. Thank you. Hi, Joan – I have not used the quilting pounce myself. I bet it would work – no harm in trying it! I don’t know what it’s made of, do you? I almost picked some up a few months ago when I was at a quilting store looking for a certain tool, but since I seem to have pounce powder coming out of my ears, I figured I’d forego the purchase! I believe the quilting pounce only comes in light powder, but I could be wrong about that! If you try it, let me know how you get on! 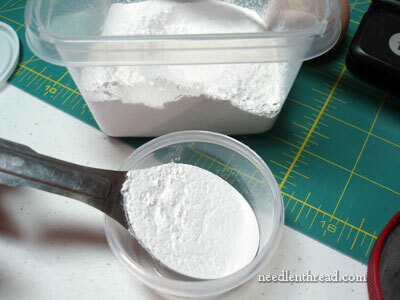 Do you suppose eyeshadows in powder form would work for pounce powder? I have tons of eyeshadows in my makeup stash that I will never use. I make my own pounce out of charcoal and talc. I use corks from wine bottles as the pouncer. I just wanted to say though it can be messy and I do it out side and in an area that the wind won’t get me and I use a mask. Talc is in the family of hydrated magnesium silicates. As it is a very fine powder I think erring on the side of caution should be recommended. Since I read about such trials 30 odd years ago I always use a mask and in a well ventilated area. As I make my own dyes and and also use commercial powders and blend them. I take precaution. It is not now that any effects shows up but it could in 5, 10 or longer years. Even so with all that knowledge I still make and mix my own powder concoctions and will continue to do so as it is part of my love of working with fibre. If I can make it I don’t buy it. I don’t use body powder either. It is too darn messy to clean away and it takes time away from my stitching. I’ve been collecting the “fines” from the bottom of the bags of charcoal. Don’t use Match Light! You don’t want the embroidery to be any more flammable than it already is! I will screen out the big pieces and see if it’s fine enough for use as a pounce powder. Then again, maybe I’ll see if I can find charcoal powder at Michael’s or Aaron Bros Art Mart. I have some ideas about the pouncer, but I’m sure you have a really, really good one, so I’ll wait and see what it is. Thanks for these really useful posts, as always. I’ve been following your amazing blog for a while….Actually I’ll let you in on a secret from the Paris ateliers…..They use a mix of white chalk or grey with …..Pine resin! – Yes! why? because after pouncing the design, they use spirits to “fix” the design to the fabric thereby eliminating the need for re-markering the fabric after. As for the exact formula – that info is “top secret” but I think maybe 40/60 or 50/50 though personally I’m leaning towards 30/70 with the larger amt being pine resin – this way ensuring a good coverage when the spirit melt the resin to fix the chalk. – Though Personally, I just use spray fix if using graphite and/or a very light coat of polyurethane for white…. Thanks ET for the info, have been searching a long while for this info. In the Neiman Marcus book online now is an interview with Lesage embroidery and they also mention resin as the material they are using for pouncing. Hi, Venessa – Yes, it washes out. It “almost” dusts out, but not quite. You should always test, though, on your own fabric, to make sure that you’ll get the results you want.